It only took 20 minutes to cross to the Makasar island from Baubau with motorboats . Along the way, we can see the clear surface of the sea. When landing on the island, visitors can immediately see the sacred cave known as Liana Binte. It is said, the cave is often used as a place of meditation to seek supernatural ability/knowledge. Around the cave there is a fairly high cliffs. 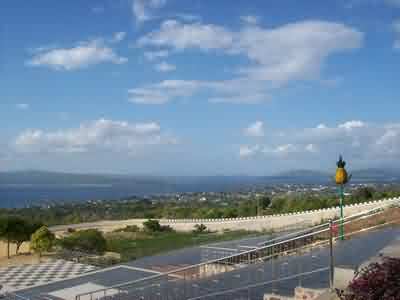 From the top of the hill the view of Baubau city can be clearly seen. After climbing back down to the east, there was the overlay of white sand called Kabungi-bungi. Tourists can enjoy the sensation of stepping on soft, flabby sand. The sea in the coastal waters presents various coral reefs and marine fish. At the end of the island, there is another island called Baana Bungi which looks just like a crocodile’s mouth. Many small villas built in the 1970s there. And the coastal waters are suitable for water skiing sports. Travelers who need quietness, tranquillity, can make the island as the best destination of a trip because, the island atmosphere is far from the frenzied. There was not even a car there! Cars can not enter because there were no roads, only walk path, and only a few motorcycle crossed it occasionally.